Think of Prince (or as he was for a while, The Artist Formerly Known as Prince, represented by a symbol) as an enigma. A hugely talented musician who’s often recorded his work completely solo, overdubbing all the instruments himself; he’s produced a huge body of work and finally graduated – surprisingly - to Las Vegas entertainer. 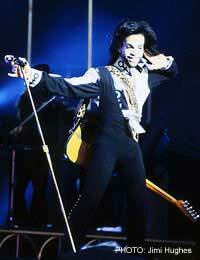 Often controversial, both for his lyrics and his business stance, he’s one of the greatest talents to emerge from the 1980s, when 1999 and Purple Rain helped make him a major star. His has been a career of ups and downs, with films, fame and relative obscurity, which has settled on an even keel. Most of the Prince memorabilia available is on the lower end of the spectrum – tickets, backstage passes, concert programmes and the like. Those go cheaply, with the higher prices demanded for 1980s memorabilia (but even those aren’t too expensive, ranging from £10-20). There are also some quite slickly produced fanzines about Prince, which can appeal to magazine collectors. Autographs, particularly autographed pictures, go for slightly higher prices, especially if framed. But you need to be certain what you’re buying. You’ll find plenty of them offered on eBay, for instance, but read the descriptions very carefully – many don’t say who autographed the picture. You might also want to compare the signature against a known Prince autograph (you can find examples online) to save being disappointed. The highest autograph prices are for signed LPs. One dealer sold a signed copy of the Purple Rain LP for £175. It’s not a huge amount, but still very respectable. Some material from the symbol period is quite valuable, such as the promotional percussion instrument (£125) or a flag (£350). This time, when Prince’s material was released by his own NPG records, found him working a little outside the industry, and so prices tend to be a little higher, as there are fewer items around. You can find a number of awards discs on the market, although you need to distinguish between the in-house awards and the true sales awards. The former run £300-400, and are more for collectors than investors. The latter will cost you £600-700, and have definite potential for investors – in fact, they represent good bargains, although it might be some years before you realise a good profit on them. Promotional items can bring good prices, but again, these are more for collectors than investors (a French game to go with one discs was being offered by a dealer for £200). If you just have to own one, you can also buy a movie cel from Graffiti Bridge for £30. If you want to buy Prince items, you’ll be purchasing either from dealers or eBay (and beware of the latter). Perhaps curiously, his memorabilia hasn’t really come up at auction, an indication that he hasn’t yet been elevated to iconic, legendary status. That, however, will almost certainly change over the next few years, and that makes him prime investment material for anyone willing to play a long game, since it could be another decade before Prince goods are reaching much higher prices. I was informed the Tambouracca instrument was valued in the £500 region - is this not true? Also I believed artefacts from his NPG shops emwere quite valuable - albeit to a collector.